If Georgia is able to beat Baker Mayfield to secure a spot in Atlanta for the championship game, tickets are currently available starting from $1,900, four times the price last year at the same time and up about $300 since the playoff seeding was set. The good news for all those Georgia fans spending money on the semi-final game is that for the National Championship they’d be able sleep in their own bed, and maybe even drive to the game. As the below chart shows this is now the most expensive National Championship game TicketIQ has tracked in 8 years. For the second season the champion of college football will be decided with a playoff. In the second year of a three year bowl rotation, the semifinals for this year’s College Football Playoff will be played during the Cotton Bowl and Orange Bowl. Unlike last year, the bowl games will be played on New Year’s Eve instead of New Year’s Day. 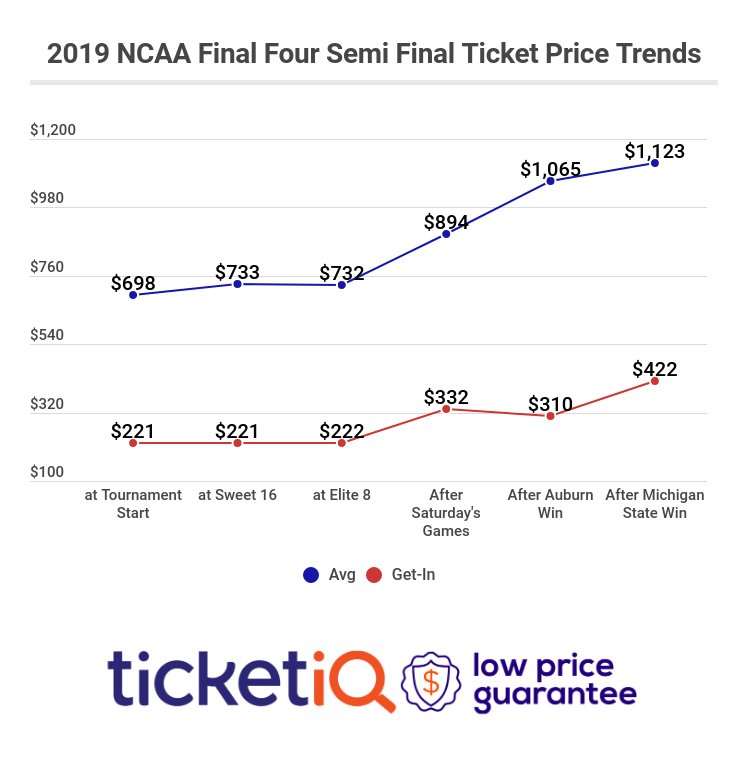 Just like last year, ticket prices for those games on the secondary market are starting to drop. In both years so far -- and all we have is two years of data for these games -- prices peak immediately after the matchups are announced then drop until game time. As the chart below shows, some drastic dips in average price have happened and should still be expected. Last year the average price for the Rose Bowl and Sugar dropped at least 30% from the time of the matchup announcement to the kickoff of the first game of the bowl season and then continued to drop until New Year’s Day. There’s already a similar drop happening for this year’s two College Football Playoff semifinal games. The Cotton Bowl, which will hold No. 2 Alabama and No. 3 Michigan State, has seen a 30% drop in average price from the matchup announcement and now sits at $321.44. No. 1 Clemson will play No. 4 Oklahoma in the Orange Bowl and the average price for that game has already dropped an outstanding 40% with a current average of $276.99. With just over a week to go until those games will kick off and the games sold out, it’s likely those prices will continue to drop as New Year’s Eve approaches.